Background: Plants, including herbs and spices, have many phytochemicals which are a potential source of natural antioxidants e.g., phenolic diterpenes, flavonoids, alkaloids, tannins and phenolic acids. Various researches have been done to find out the relative antioxidant activities of various herbs, fruits, vegetables and spices. Objectives: Present study was carried out to evaluate the antioxidant status of five common spices namely Brassica nigra (Rai), Foeniculum vulgare (Fennel), Carum copticum (Ajwain), Nigella sativa (Kalonji) and Sesamum indicum (Til). 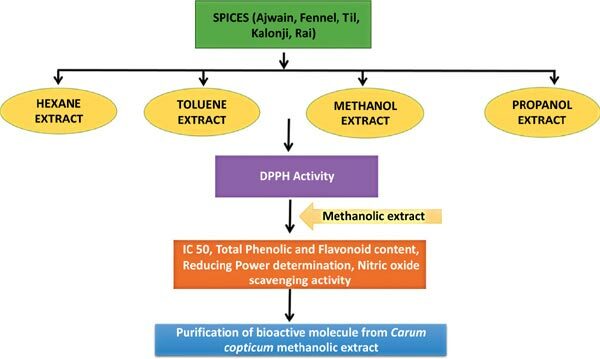 Methodology: In-vitro antioxidant study of these spices was examined by using the popular method of DPPH free radical scavenging activity and FRAP methods. The total phenolic compounds were measured using the Folin-Ciocalteu reagent in an effort to validate the medicinal potential of the spices. Results: The antioxidant activity of the methanolic extract of Brassica nigra (92.8%) was observed to be the highest followed by Foeniculum vulgare (91.8%), Carum copticum (89.7%), Nigella sativa (83.2%) while for Sesamum indicum, least antioxidant activity was recorded (38%). Their IC50 ranged from 4 mg/ml in Brassica nigra (Rai) to 8 mg/ml in Nigella sativa (Kalonji). Nitric oxide scavenging activity was highest in Rai (11%) and lowest in Til. The ferric reducing properties of the above spices were also found to be quite appreciable. Highest phenolic content (based on Folin’s Ciocalteau method) was shown by Carum copticum (18.1) whereas highest flavonoid content was recorded in Foeniculum vulgare (20.7). Conclusion: The significant presence of phenolic and flavonoid content revealed that the spices can be used as rich sources of natural antioxidants against various oxidative stress related disorders. Keywords: Spices, DPPH assay, phenolic content, flavonoid content, phytochemical. Keywords:Spices, DPPH assay, phenolic content, flavonoid content, phytochemical. Abstract:Background: Plants, including herbs and spices, have many phytochemicals which are a potential source of natural antioxidants e.g., phenolic diterpenes, flavonoids, alkaloids, tannins and phenolic acids. Various researches have been done to find out the relative antioxidant activities of various herbs, fruits, vegetables and spices.